Hong Kong, March 15th , 2016 – Global research from the flexible workplace provider Regus has revealed that business people believe the right location for their business needs to be smart, professional, inspiring and, unsurprisingly, cost effective. Entrepreneurs agree that a “professional-looking office” helps them punch above their weight and also rank a “creative working environment” in their top three criteria when it comes to choosing an ideal business location. Canvassing the opinions of more than 44,000 respondents from 100 countries, including 349 professionals in Hong Kong, the research found that 60% respondents globally believe the ideal location needs to look the part. However, while “a professional image” is clearly a key selection criteria for global businesses, cost-effectiveness is also a major concern, with 52% saying “value for money” is a critical factor for businesses starting out on a shoestring. The sentiment among Hong Kong professionals is similar to the global feeling, with 66% of Hong Kong respondents agreeing that professional locations make their business “look like a bigger firm” and 46% caring about value for money. However, local professionals cited “proximity to potential clients” (41%) as the third important factor when it comes to choosing an office, whereas their global counterparts weighed “a creative, modern, lively environment” (45%) over the convenience of being physically close to potential clients (36%). Interestingly, a number of Asian markets are ahead of the global curve. Some 61% of Mainland China respondents believe that “working in a lively and creative environment” is the No.1 consideration when selecting business location, with 60% respondents in South Korea also ranking this as their top criteria! Overall, budget-strapped start-ups/entrepreneurs globally appreciate the value of a “professional office” (63%) and “cost-effectiveness” (56%) more highly than general business professionals. The top office selection criteria among Hong Kong entrepreneurs are on par with global counterparts with 60% wanting their offices look smart, 56% caring about value for money (the same as the global rate). 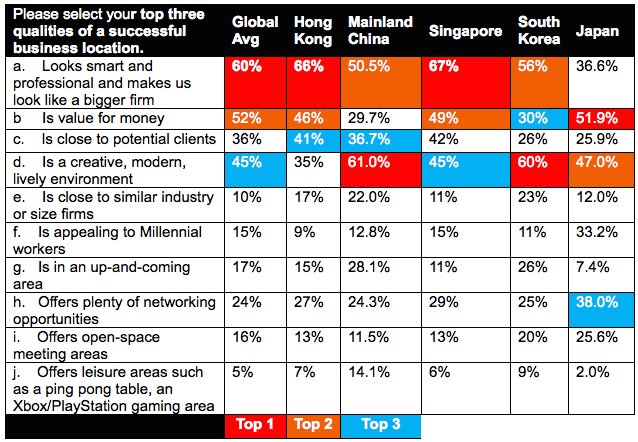 One statistic stands out among Hong Kong entrepreneurs compared with global peers — only 7% of local respondents would factor “appealing to millennial workers” in their decision-making process, whereas the percentage among global entrepreneurs is nearly double (13%), and the percentage in Japan (30%) is four times higher than that of Hong Kong. “The location of a business continues to play a pivotal part in operations, from talent acquisition, to being close to potential prospects and enabling smaller businesses to compete with the big spenders. The way businesses operate has changed over the years, with workers now able to work on the move and from a variety of flexible locations. However, finding the right main location for your business is clearly important to success and selection should not be taken lightly,” said Natina Wong, country manager of Regus Hong Kong. “As well as providing a ‘bigger-business’ image, the right business environment helps to boost productivity, creativity and can drive growth. Additionally, working from the right location helps place businesses in a modern and lively setting, and can increase the potential to network with other professionals.” Wong added.